Artists and Scientists use a similar approach in creating their work. Scientists and artists are creators and they often work around and outside of the known concepts. My art process could assist life sciences in the further development of acoustic physics, and sonocytology. When art and science practices together they create a physical thing that can communicate the scientist’s theory to the outside world. It is often found that the artist has been working around and with various theories well before the scientific discovery is made and documented. Many artists use code and data found in the world around us to influence their work. They may make structured forms or mark making in response to found data. In my work, I am using neurological equipment to record physical responses within the brain, and demonstrating how the brains response communicates to its environment. I will be using this found data to create mark making using a formula found in my research called cymatics. Click here for research on theories and recording. 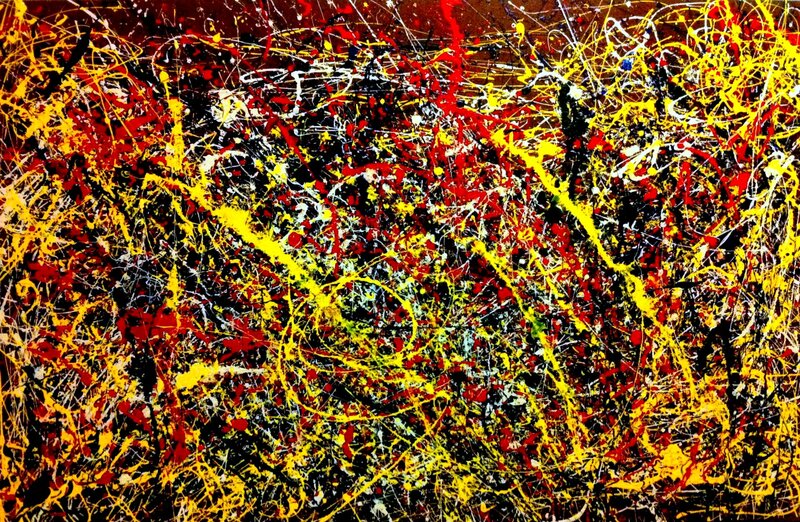 Pollock was a controversial artist, many people thought his work was erratic and lacking in skill. We have now discovered that Pollocks paintings contain a pattern that represents fractal data. Physicist Richard Taylor realized that the fractal equation could be applied to Pollock’s work. Richard Taylor has created a machine called The Pollockizer which replicates Pollock’s process. Some fractal patterns exist only in mathematical theory, but others provide useful models for the irregular yet patterned shapes found in nature—the branchings of rivers and trees, for instance. Mathematicians tend to rank fractal dimensions on a series of scales between 0 and 3. One-dimensional fractals (such as a segmented line) typically rank between 0.1 and 0.9, two-dimensional fractals (such as a shadow thrown by a cloud) between 1.1 and 1.9, and three-dimensional fractals (such as a mountain) between 2.1 and 2.9. Most natural objects, when analyzed in two dimensions, rank between 1.2 and 1.6. Student presentation. Escher followed mathematical equations when creating his complex patterns. The visual results he achieved are very powerful. When the human brain interacts with the image it tries to work out the code. Escher trained as an Architect. He was inspired by crystal formation and fractals. His way of thinking helped the mathematicians discover new theories. Escher was more respected within the scientific world than in the art world. Escher Tessellated shapes and used hyperbolical mathematical equations.